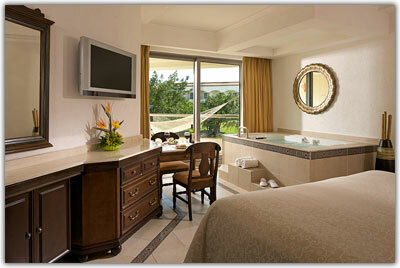 The Aventura Spa Palace is now the Hard Rock Riviera Maya. To learn more about the newly renovated property, please click here. 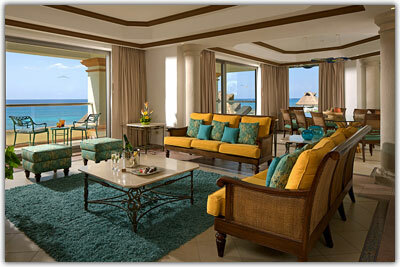 Guest accommodations include 777 beautifully appointed rooms, most with a full or partial view of the Caribbean ocean. Rooms come with marble bathroom and glass-enclosed shower, private balcony/terrace (many with hammocks), double Jacuzzi, marble flooring, individually controlled air conditioning, satellite TV with remote control, purified water, coffee makers, alarm clock, in-room safe, direct dial telephones, hair dryers, mini bars containing all types of beverages, turndown service upon request (standard in suites), iron and ironing board, and data ports (in some rooms). Deluxe Resort View - 484 sq. ft. One king or two double beds, in-suite double Jacuzzi; private bath with shower only. Additional amenities include flat screen LCD TV with satellite; complimentary unlimited phone calls to Mexico, Canada and USA (certain restrictions apply); complimentary wireless internet access; in-suite digital laptop-size safe; liquor dispensers containing whiskey, rum, tequila and vodka; mini-bar stocked with sodas, bottled water, juices and domestic beer; Farouk Biosilk bath amenities; balcony with chaise lounge, chairs and table. The views are limited and could be partially obstructed. This category does not include any type of ocean view rooms. Superior Deluxe Garden View - 484 sq. ft. One king or two double beds; in-suite double Jacuzzi; private bath with shower; balcony, garden view. Additional amenities include flat screen LCD TV with satellite; complimentary unlimited phone calls to Mexico, USA and Canada (certain restrictions apply); complimentary wireless internet access; in-suite digital laptop-size safe; liquor dispensers containing whiskey, rum, tequilla and vodka; mini-bars stocked with sodas, bottled water and domestic beer; Farouk bath amenities; purified water. Superior Deluxe Ocean View - 484 sq. 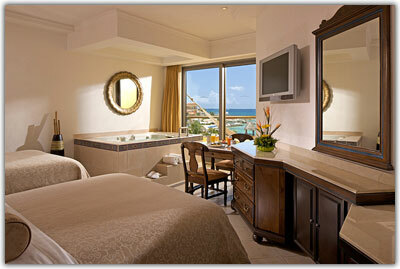 ft. One king or two double beds; in-suite double Jacuzzi; private bath with shower; balcony, ocean view. Additional amenities include flat screen LCD TV with satellite; complimentary unlimited phone calls to Mexico, USA and Canada (certain restrictions apply); complimentary wireless internet access; in-suite digital laptop-size safe; liquor dispensers containing whiskey, rum, tequilla and vodka; mini-bars stocked with sodas, bottled water and domestic beer; Farouk bath amenities; purified water. Concierge Level - 559 sq. ft. Premium resort location. 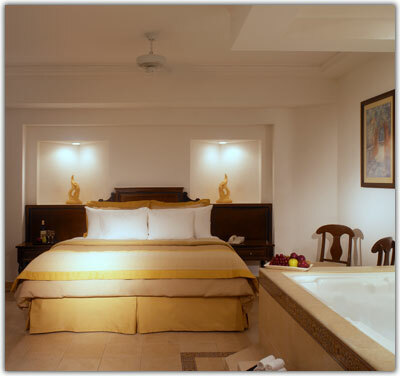 One king bed; in-suite double Jacuzzi; private bath with shower; balcony, ocean view. Additional amenities include flat screen LCD TV with satellite; complimentary unlimited phone calls to Mexico, USA and Canada (certain restrictions apply); complimentary wireless internet access; in-suite digital laptop-size safe; liquor dispensers containing whiskey, rum, tequilla and vodka; mini-bars stocked with sodas, bottled water, juices and domestic beer; L'Occitane bath amenities. Exclusive Concierge Level Amenities: Private check-in/out; early check-in and late check-out (subject to availability); select room service menu; two 25 min. massages; nightly turndown service w/petit-fours; upgraded Espresso/American coffee machine; DVD player; iPod dock; radio-alarm clock CD player; pillow menu; aromatherapy; CHI professional blow dryer; exclusive concierge service; upgraded brands in in-room liquor dispenser; exclusive beach bag; private beach lounge chair area w/waiter service; private candlelight dinner at select locations (once per stay).